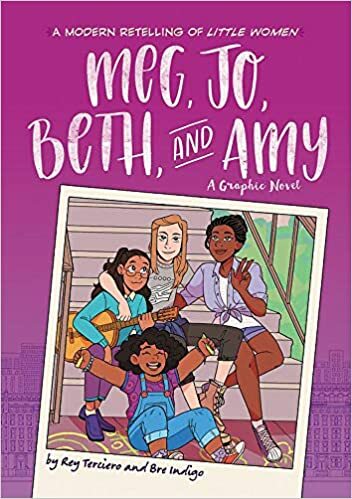 Summary: If the names Meg, Jo, Beth, and Amy are familiar to you, you will recognize this as a modern-day retelling of the just-turned-150 book Little Women by Louisa May Alcott. In this version, the Marches are a blended family, with a black father of Meg, a white mother of Jo, and biracial daughters Beth and Amy who share both parents. In the opening scenes, the four girls are trying to survive a Christmas without presents while their military father is overseas. Mom (you may know her as Marmee) helps them get some perspective by serving meals in a soup kitchen; on the way home, they meet their wealthy neighbor and his grandson Laurie. There are some plot modifications from the original (a few spoiler alerts): Jo comes out as gay; Beth gets leukemia and almost dies (whew! ); Meg breaks up with Brooks and decides to pursue a career as a lawyer. The theme of family love is still strong, though, and sustains all four girls as they make their way through a tumultuous year. 256 pages; grades 5-8. Pros: As a big fan of the original novel, I enjoyed seeing how Terciero stayed true to the essence of the story while realistically updating just about everything. Even those who haven’t read Alcott’s work will enjoy the story and the touching relationship among all the family members. Cons: Meg and Jo’s letters to their father at the beginning of the story, designed to get the reader up to speed on the family’s history, came across as awkward and sounding like their father had lost his memory or something.